Good morning-as I take in our view from the apartment window I see the beautiful ocean and mountains, my eye scans to the right where I spot two naval ships and above three helicopters are circling overhead and I am thinking...that we possibly could be more protected right now than the President of the United States. Hat's off to Brazil for their efforts of keeping the Olympics safe! Everyone we have met has been so helpful and friendly...take yesterday for example as Mishal, Hannah, and Hannah make our way to the beach and we are greeted by Marcelo, in a speedo no less...and I mean no less, he wants to know if we want to play beach volleyball on his team, we respectfully decline and he proceeds to make sure we get through to the beach through the courts-I hold out my hand to introduce myself and thank him and he shakes his head no and holds out his cheek-a light comes on in my head and I realize the customary greeting here between us is going to be a kiss on each cheek, my roomies look on in amusement on how I am going to get out of this one...well the truth is, I am not, Marcelo is waiting and so I meet him "cheek on"- Marcelo and I exchange an air kiss and we are on our way...but not before Marcelo announces us to his teammates and everyone he knows at the beach that we the Americans are coming through-what an entrance we make...there goes the recommended low profile we are to keep, hey there was nothing we could do but put our towels down and be tourists and that we did. Stay tune will be back with more from RIO and our adventures on game day...please tune in and cheer on the USA today! Top of the day to you! People have been so friendly here, you just have to look like you need help and they offer-so refreshing! Yesterday we visited the Procter & Gamble Family House. They are an official sponsor of the USA Olympics and provide a place for athletes families to go and chill everyday from 11 a.m. to 11 p.m. Upon registration we get a name badge, family pin, and a bag of P&G products. Then begins our tour of services they offer completely complimentary: Dining 2x per day, laundry service, yes you bring your dirty laundry they wash it and you pick up next day. For the guys, they have an area called the "man cave" where the guys can get a professional shave (first thing Rob did, loves them and hasn't had one since the day we got married), hair cut, shoot pool, play video games and watch sports on flat screens everywhere. Gets better ladies, they have a full-service salon for the Mom's and any of their guests, manicure, pedicure, complete makeovers, facials-awesome! There are places to write your athletes messages, take pictures of posing in Olympic events. Lots of fun! Totally unexpected-very appreciated! The most valuable thing in my opinion is hanging with the other athletes family's, hearing their stories about their athletes, they all have a similar ring-hard work, dedication, sacrifice, rebound from injuries, disappointments, and triumph! Tears of joy! We watched the ceremonies there, with the other families, they served champagne and appetizers, and dropped red, white, and blue balloons from the ceiling. Fun! Nolan and I think we saw Christa for a second, but not sure. It doesn't matter she was there. The Americans looked so classy! Big Highlight for Nolan: Shawn Johnson was in the house and Nolan got a picture with her, she sat by us most of the night! Go Nolan! Game tonight! I will check in tomorrow! GO TEAM USA! 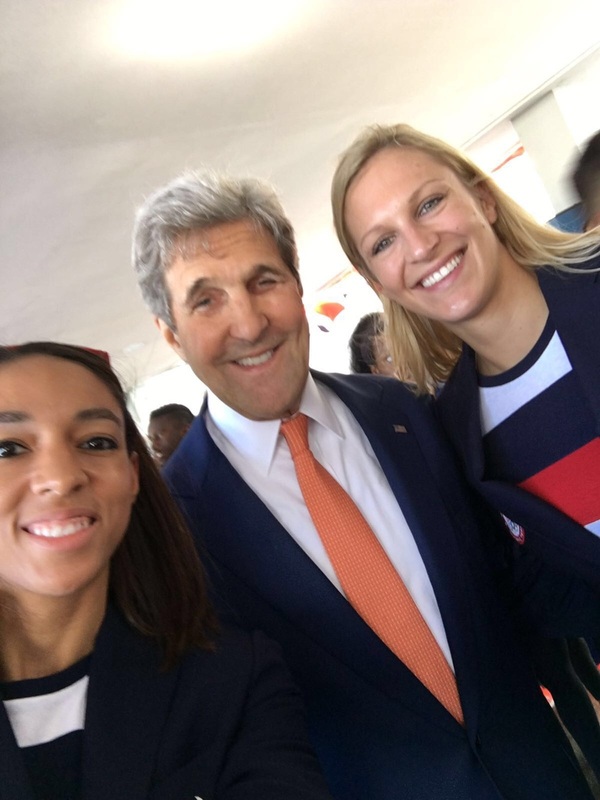 The whole USA Team was able to meet with Secretary of State John Kerry! Celebrating opening ceremonies at the P & G House-reunited with the Thompson's again and making new relationships with the Hill's and Banwarth's. The rest of the gang are on their way...looking forward to being all together. It went something like this...She turns to her deflated teammate looking up from her stretching routine locking eyes and saying... "it's not over yet"
Good Morning from Rio De Janeiro...we made it! This morning we were met at the airport by Karla. She has been our liaison to RIO and a huge help. Karla was born in RIO and lived here all her life, aside from the four years when she attended college in the states…she has may friends in America and has a real feel for our culture. "The roomies" I will refer to them now are: Derek (the "Pres" President of Christa Enterprises and also her husband) , Mishal, Christa's mommy in law, Hannah D, Christa's sister in law, Hannah P, Christa's cousin, Rob and he has many titles: Christa's dad, travel coordinator extraordinaire, USA women's volleyball team friends and family liaison, and me, Christa's mommy. On our way to our RIO home she points out that security is at a premium, (riffled military on every corner-previous reports have been that there is no security), the subway is up and running as it has been for the last 20 years (previous reports that it was down and it won’t be ready for the games), that the water is polluted Karla reports…while you will see pollution in the bay area…the “free ocean” across from our RIO home is business as usual-beautiful! Karla doesn’t recommend that we drink the water (which is the norm for any foreign travel) Karla reminds us to use common sense when going out…she recommends the routes we travel. Karla points out all the local eateries and a very famous one called Shirley’s. Our apartment is located on LEME beach where the outdoor volleyball venue is on this site as well...the place will be hopping, the Today show is broadcasting live on this beach. So, we, the roomies, continue on this journey armed with bug repellent and our new founded “street smarts” breathing a little bit easier by the news our new friend brings. Actually with all this, I am feeling my sense of adventure loosen…we grab a bite to eat at a little Italian restaurant and our group decides to make our way to the P & G House (Procter & Gamble). The P & G House is a place where Olympic athlete’s families can go and be at “home”. Living spaces equipped with food, drink, huge lounging areas, full service salon, a man cave, a roof top bar and restaurant, music, 24- hour laundry service just like home, right moms…well actually it's nothing like home mom, because they do the laundry for you. Rooftop at the P & G house where we will celebrate the opening ceremonies tonight with family and friends! Go USA! Good Morning! I think I have finally got enough sleep (jet lag) to write a few legible thoughts today. We arrived yesterday morning in London. We weren't sure what to expect with all of the previous news reports about Olympic security and public transportation. Aside from an area that was set up as a processing place for Olympic athletes and an area for news reporters and photographers-it appeared to be "business as usual" We got our baggage and proceeded to the transportation area where we saw a gentleman (shirt and tie) holding a sign up "Mr. Harmotto" our transportation. On a normal day the commute is 40 minutes and that is how long it took- still business as usual. Grandmother was surprised that Rob would be the driveror I should say appeared to be. That takes some getting use to - the same with stepping off of the sidewalk. Our normal is switched and thank goodness they have it marked on the streets LOOK LEFT or LOOK RIGHT before stepping off the curb. That was helpful on 4 hours of sleep, and trying to navigate our way around. On the way we passed some industrial areas but mostly we were weaving in and out of little towns with tutor style houses and apartments with the rod iron flower boxes, very clean streets, narrow too. We arrived at Marylebone, where we are staying in a two bedroom apartment. The area is really nice with cafe's, pizzerias, pubs, boutiques and other shops lining the streets. Last night we took a walk to Regent Park and passed an exclusive area that I was sure would have been normal to see Madonna on her balcony. Tickets for opening ceremonies events we heard, if available, are going from around 6 to 10k a piece. Not sure where we will be watching the opening ceremonies today-there is a place for the families of athletes to watch it so we are going to check into that. Long Beach, CA- The top-ranked USA volleyball team hosted the second weekend of preliminary rounds in the FIVB World Grand Prix where they swept competition before heading into the final weekend of preliminary stages. It has been 20 years since the U.S. Women’s National team had the privilege of hosting preliminary rounds of the FIVB World Grand Prix and they didn’t disappoint. The Americans came out facing No. 11 Germany for the second time in two weekends were able to pull out a victory defeating the Germans 25-17, 24-26,25-10,25-23. In the win, Christa Dietzen added eight points with three kills, three blocks and two aces. With a home crowd chanting and cheering U-S-A, the women stepped back out on the court the next night to face No. 5 Japan. In front of a home crowd of nearly 5,000 the Pyramid was rocking as fans stepped in covered in red-white-and-blue in support of their country. The stage was set and the fans were on the edge of their seats as Team USA and Japan stepped onto the court. Once again the U.S. women took the energy from the crowd and compelled it into a victory, defeating Japan in three straight sets; 25-16,25-23,25-21. The USA has now won 21 of its 27 World Grand Prix matches with Japan. Heading into the final night of competition at the Pyramid, team USA seemed to be hitting their groove. Showing no signs of fatigue, but only playing better with one another as matches went on. They faced off against No. 10 Turkey and swept them in three straight, winning 25-21,25-20,25-16. After several challenged calls and Turkey attempting to slow the pace of the game they just couldn’t stop the dominating offense team USA brings to the table. Turkey put up a fight and tried to slow the Americans down, but they had already run away with it and were able to pull out a victory and improve to 5-1 in the FIVB World Grand Prix. They also moved into third place overall with 15 points. Team USA is now in China where they are facing off in the final weekend of preliminary play. Follow along as we make the #RoadtoRio. Murrieta, CA- The USA Women’s National team hosted a Red-Blue intrasquad scrimmage at Murrieta Mesa High School this past Friday night where they played four sets, exhibition style with the blue team winning three sets to the red teams one. Christa Dietzen along with teammates Alicia Glass, Jordan Larson-Burbach, Kim Hill, Kelly Murphy, Courtney Thompson, Nicole Fawcett and several others were staples in the blue lineup while other athletes like Karsta Lowe, Rachael Adams and Kelsey Robertson would switch teams between sets. A crowd full of high school athletes and local volleyball players ignited the crowd as the gymnasium reached full capacity to see team USA compete. In set one it was a seesaw match with both teams fighting hard for points and trading licks with the blue team leading for most of the match. The blue would finish set one taking a 25-22 victory. Set two started differently with the blue team getting off to a slow start and falling behind 8-3 to begin play. Murphy would win a big point for the blue team and shift the momentum of the team to inch to 9-10 before they would begin their run and take the lead for the first time in the set. Two points later, Dietzen went right at three blockers from the middle and put it away for an 11-10 lead in blue favor and force a timeout for the red side. Dietzen would earn a one-point advantage before she would step back to the serving line and finish set two up 27-25. Heading into set three fans were encouraged to boo the team in order to prepare them for their road games coming up and all of the rowdy crowds they will encounter. 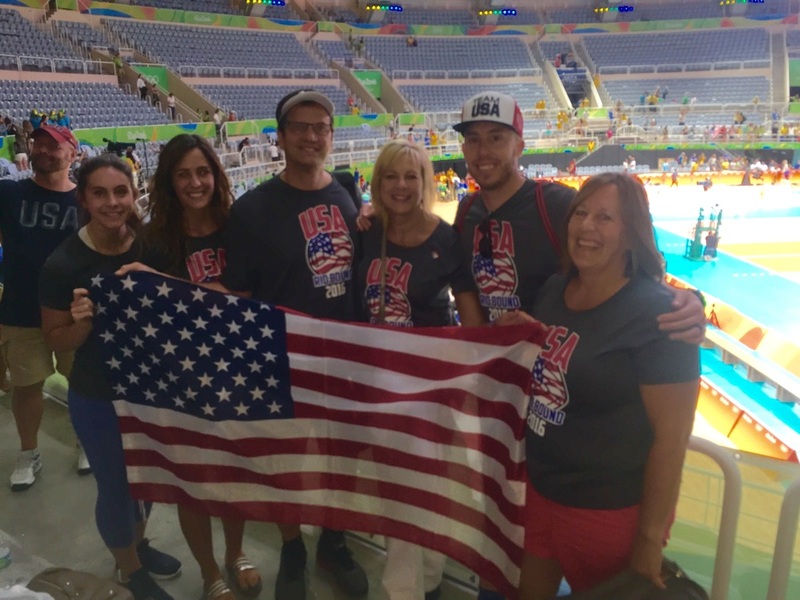 Team USA fans did their best impressions of Brazil and cheered loud against the athletes they have grown to love in order to help them mentally prepare for their upcoming road schedule. Set three would be a nail biter with both teams giving it their all and showing the fans how deep their bench goes as each team would compete and earn points on one another. A Larson-Burbach kill that would loosen the hardwood brought the people to their feet and from there no one could look away. The duo of Dietzen and Larson-Burbach built a wall on the outside blocking everything coming their and leading the team from the net. Eleven ties later and the red team fighting off nine set points they were able to pull away with it and win set three 36-34. “It’s so amazing to see the teamwork and dedication they put into this along with getting to watch them so locally,” Katie Nugent, a 10th grader from Mission Vista High School said. Nugent along with her sister Annie Nugent and cousin Amy Mejicanos were so excited to be at the game and cheering on their favorite players as they are young volleyball players with the dreams of someday being where they are. “I love being able to see the highest level of play possible especially being an Olympic year and knowing that I get to play this sport too is a really cool feeling,” K. Nugent said. The match would then finish with a 27-25 victory in set four for the blue team and prove that every set both teams battled for the victory. Dietzen and her teammates would then sign autographs and take pictures with fans who lined up around the gym anxious to meet the women. The USA Men’s and Women’s teams will both be playing in the third Red-Blue intrasquad scrimmage on May 27 at Santiago Canyon College in Orange County. The U.S. Women will play at 6 p.m. and will be followed by the U.S. Men’s team as both compete in an intrasquad showdown. It's that time of year again. It's the first week of May. The temperature starts to climb within the walls of the American sports center. The black tarps reappear to separate the courts, bags begin to fill the shelves in the training room, and the music starts bumping at 8:10am as we take the floor to warm up for training. Every week more fuel is added to the energy in the gym as familiar faces reappear from their seasons across the globe...picking up right where we left off, trying to do something better than it's ever been done before. You can say we ended last year on a high note, winning our first ever gold at a major international tournament, but complacency does not exist in the USA gym. Sweet, we are World Champions..but are hungry for so much more. Learning everyday about ways we can be better volleyball players, teammates and human beings. Look out world, USA is coming for you. We are about to GET SOME more. My husband, Derek and I decided to take our Honeymoon several months after our wedding when our schedules (specifically mine) settled down a bit. Even though our lives are quieter this season of the year, we still found ourselves having a difficult time disconnecting from the outside noise and thoughts of our daily lives. I think that probably goes for anyone these days, with connection at our fingertips...literally. We were in a beautiful, all-inclusive resort, right on the ocean in Riviera Nayarit, Mexico. You wouldn't think it would be that tough to unplug and relax, but it was hard to let go of what was happening at home because we were so use to being "connected". The first couple days we continued reading the books we had been reading back home, that both involved leadership and mindset. Not that there was anything wrong with these books, but we found ourselves having a difficult time "shutting off" our brains from work-related scenarios. So we put down those books and downloaded books that had nothing to do with our daily lives. I chose a Marc Cameron thriller and my husband chose something about Wall Street. Those books were our ticket to unplugging and settling into mental rest. Experiencing rest, meant we needed to unplug from thoughts of our daily life. Last year I was welcomed into a tradition of sharing. At the end of each year my in-laws sit around the fire to reflect on the past year and then set goals and dreams for the following year. We share something positive about the year or maybe a goal we accomplished. We then share a growth area that may lead to a goal in 2015. Is there something we can improve? Is there an area that requires change? It's a very powerful and encouraging time. We record these goals and reflections in a journal and refer to them throughout the year. Here are a few examples of goal-setting categories. I encourage you all to find a family member, a friend, or both and reflect on 2014 and share your goals of 2015. Here is a look inside the daily life of Anna Dietzen(my sister-in-law) and her family with two special needs boys. Below is a brief description of the blog. My point of view is in Normal text and Derek's point of view is in Bold. Airports and airplanes…Where I spend a solid chunk of my year. It was February 9, 2013. My professional season ended in Modena, Italy and I was en route to Southern California after spending time with family in Pittsburgh, PA. On this particular flight I was upgraded to first class...and so was this man named Bill. Who is Bill? Bill is on the pastoral team at a church in Orange County, California. Born and raised in Pittsburgh, Bill now chooses to reside with his wife in a place where the sun always shines...I don't blame him. Bill and I began to make small talk and eventually made a connection that we belonged to the same church (Rockharbor). We carried on conversation the entire flight and I made plans to go hear Bill speak at church in March and meet his family. Fast forward to the middle of March and I found myself at Rockharbor Fullerton again. Bill was speaking and Matt and Shannon had invited me to come. Once again, this time about 5 mins into the service, I notice Shannon waiving to get my attention, then pointing towards the entrance and swinging her arm like she was spiking a volleyball. I figured one of two things, she had this crazy urge to get her game on OR, the actual reason, she was pointing to the tall, beautiful, charismatic, service halting, sling-wearing blonde who just walked in. Yes, she was in a sling as she had just had shoulder surgery. I was on crutches as I had just had meniscus surgery. Those of you who know us are not at all shocked by this irony. I thought to myself, “was this THE girl?” The rest of the service I kept pulling the “my back is tight so I’m going to twist and ‘stretch’ but really I’m trying to look behind me at this beautiful woman and get a better glance” move. I couldn’t focus on anything but trying to eye her. Finally the service ended, this was my moment. I’m going to meet her and make her laugh and she’ll fall in love with me and we’ll live happily ever after. I’m a bit of a hopeless romantic. SHHHH don’t tell her. Here it was, she was coming over to say hi to Bill and meet Matt and Shannon and….NOT me. Thanks a lot Shannon! Leave me hanging why don’t you? There goes my shot of falling in love with her! Back to ramen filled bachelor life. To keep everyone on the same page throughout this story..March, April, May and June have now passed. I have not heard of or know of Derek at this point. It was just another Sunday in July and Bill was speaking at RH Fullerton again so I went to hear him speak with Matt and Shannon. Afterwards we all went out for lunch and I got the pleasure of speaking will Bill for quite some time. We talked about life, work, God, family, you name it we covered it. Bill is one of those guys who you could talk to forever and whether you’ve known him for five minute or five years you feel like he genuinely cares about you and knows the real you. I should mention that you feel this way because he DOES genuinely care. He just brings that to the table no matter the conversation. Hey. This may b nuts. But what the heck. If u r not in a relationship at the moment I know a young 26/27 year old guy who actually goes to RHCM(our church) who specs out really well... 6'4"ish Biola pitcher with college volleyball sisters (one coaching in Spokane now) awesome family, loves Jesus w all his heart. Working and working really well in the lending/investing world. I don't have a word from The Lord here or anything, but just think the world of him. Ps. Derek Dietzen is his name. I'm really laughing right now. I guess something jogged Bill’s memory, I’m pretty certain it was the Holy Spirit because this sort of thing doesn’t happen without His hand working because the next night I got a text from his daughter Shannon that read as follows (no, I haven’t erased it, yes I’m a sap, sue me! ): “Yo D ! Guess what?! My dad emailed Christa Harmotto and asked if she is open to getting set up and he wrote a few nice things about you (he must have had to work real hard at that ) She said ‘for sure!’ (I imagine it was more like “ummm does he have a criminal record? Will you be coming on the blind date? Oh fine I guess..” but I’ll take it!). I’m slow but I’m not completely stupid and I knew this was my first test. Call or email? Ha! Like I had a choice. But just in case I asked my sister and Shannon and they both agreed with my initial instinct which was to call her. Derek of course did the whole "guy thing" and didn't call me until Wednesday night. At least he didn’t email. Hard ball. My masculinity immediately took over and the head games began. When should I call her? Does she want to be called? Was she just being nice? Is this the right number? Did she give me her dad’s number so he could give me the “Son I own a gun” speech? I didn’t want to appear desperate so I had to give it some time. But at the same time I didn’t want to miss out on this opportunity of a lifetime. Something in me was nervous, but at the same time calm and confident about the situation. Again, I believe it was God working in me and even starting to work in “us”. I finally decided to call her that Wednesday, at 8:30 PM. Don’t ask me how I decided on this but trust me it was well thought out and seemed like the only reasonable option at that moment. Stop judging me. I was as giddy as a school girl and rehearsing what I’d say like I was going in for an interview. I’d practiced every scenario and even done some voice exercises. I wanted to “wow” her with my phone skills. Oh yea I was ready…. It was time; 8:30 had arrived. I dialed the number and nothing could have prepared me for what happened next. Voicemail. It was Wednesday evening and I was at a worship night at church. I always turn my phone off during church. Not one ring and straight to voicemail?! I hadn’t prepared for this! What do I do? Leave a voicemail? Hang up? She doesn’t even have an actual voicemail just one of those dumb automated messages that tells you what number you’ve called. The ones we all hate and that don’t help one bit! For all I know I could have been leaving a message for Helga, the nightmare nurse we all fear who looks like she flosses with rope and smells like she smokes a pack of Menthol lights a day. And then the dreaded “tone” came. It was “go time”. To give you a little back ground…in my business a lot of times I am referred to people so when I call them I start off with “Hi, my name is Derek Dietzen and I was referred to you by so and so.” Yup, you all know where this is going. I still have the voicemail saved. So, I start off with, “Hi Christa, my name is Derek Dietzen and I was ref…Bill Gadd gave me your number and” I don’t remember what I said after that. I just remember fumbling and rambling on for what seemed like way to long. I finally ended the train wreck and conceded to the fact that I would never hear from Christa Harmotto. Good game, nice try, maybe next time buddy. I turned my phone back on once church ended and I saw that I had a missed call and voicemail from a Spokane, Washington area code. (Of course I knew Derek was from Washington already..thanks Facebook). I got the "girly giddies" and called him back on my way home from church. Straight to voicemail. Well, honey, we were off to a great start. Derek called me back shortly after. Hold on though, she did call back but I was on the other line with my mom. I had a choice, hang up on mom and answer or let her have the joy of going to voicemail. Voicemail it was! Plus how could she resist a guy who loves his mom?! He called me back shortly after I left a message. He said he was on the phone with his mom. Awwww. Family man! Loved that already! Derek was so easy to talk to and I just cut to the chase and said that we should chat in person…I don’t mess around. I called her back and that’s when it was over. I mean as far as me ever wanting to search for another girl. She was so easy to talk to, she was intriguing, asked questions and even threw in there, “well I don’t want to get to know all about you on the phone, do you want to hang out?” Well that was the easiest date I had ever got! This was my kind of girl! So it was settled. Our first date would be the next day. Thursday July 18, 2013. It was Thursday morning at practice during a 6 on 6 drill and I was playing defense. If anyone knows anything about ME playing defense…the next part won’t surprise you. I got CLOCKED in the face by a back row attack(Murph, you are part of our story ;)). Let's just say I was borderline concussed… concussed or not, I was going on that date. Our first date and the “last first date” for both of us. Just saying that makes me smile. She let me pick her up and even though she had a mini concussion, the date was phenomenal. We went to the Great Maple at Fashion Island and the conversation was amazing. We talked about family, careers, her volleyball, my baseball, God, our faith, our testimony. We talked about everything and it was AMAZING! We literally shut the place down. They had to ask us to leave even though I hoped they never would. I don’t know if I ever fully admitted this to her, but I knew I would marry her after that date. She was the most beautiful, caring, driven, successful, family-oriented, God-fearing, humble woman I had ever had the chance to take on a date and the type of woman I always dreamed of marrying. What confirmed this even more was I knew this was the type of woman my parents had been praying for to come into my life and be my wife since the day I was born. Derek was quite the gentleman. He picked me up, came to my door, and opened the car door for me all evening. We had dinner at the Great Maple in Fashion Island. I remember it being so natural and easy to talk to him. I loved how much he talked about his family, his faith and to hear how hard he worked to get where he is now in his business. I felt like I could talk to him for days on end. We had so much to talk about, we closed the restaurant down. :) That desire of communication and learning about each other would end up being a big key to the growth of our relationship in the coming months. Derek and I went on 5 dates in 10 days…Then I left the country for a 5 week trip. Ha! Welcome to the world of a professional volleyball player! I remember being pretty nervous to share more about my lifestyle of spending so much time away, with the risk of him running the other direction. I was amazed at how understanding and open to seeing where this relationship would go, regardless of the crazy lifestyle I lived. The Lord was already doing work in him. Derek was intentional about communication and we decided to read a book together while I was on the road. There was no pressure on what would happen or how we would communicate, but I found myself wanting to talk to him everyday. Thanking God for technology and the growth that came along through communication despite distance. It’s funny how you skip the small talk when all you have is communication and get to the real conversation. I look back on that 5 week trip and how much it tested our relationship and at the same time strengthened it and find myself so thankful. I had always thought I would have to marry someone who was a current athlete to relate to all the crazy stuff that goes on between my ears, but Derek not only related, he encouraged, and has been with me every step of the way from the day we met. As I mentioned earlier, God’s hand was in this from the beginning. From even before the time he had both Christa and Bill upgraded and seated together. And when God orchestrates a relationship it is destined to be beautiful and a blessing to all involved. I thank God every day for Christa and this relationship. They both have taught me about God’s love for us, His grace, His promises and His faithfulness to us no matter what life throws at us. Injury comeback stories are like reading the introduction and the conclusion to a book. I remember the day it happened, how it happened, and the thoughts and emotions the first few days...then...I fast-forward to months later and I remember my first day back on the court. But what about the body of the story? What about all the hours, days, weeks, and months in between? The day-in and day-out grind of mundane exercises? The mental toughness, countless lessons, and unmeasurable growth that come as a result of the ebb and flow of the rehab process? Being through the process several times throughout my career and specifically the surgery/rehab process 4 times, I reflect back and appreciate the time spent in the body of my story. OR......what about this angle. What if the little victories weren't only based on progress relating to the body part injured? What about an improvement in attitude, approach, or maybe progress in strengthening the upper body if the lower is injured? Those are worth celebrating too. Sure, sometimes the rehab process is 3 steps back and 1 step forward, and no doubt those can be discouraging...but think about where you were 3 weeks ago or a month ago. Look at all the progress you made and celebrate that. Sometimes it's not just about "better than yesterday," it's that you are "better than 2 weeks ago". If you don't believe you made progress, keep a journal. You can look back and see the mental, emotional, and physical growth you made throughout and when the time comes for you to start bouncing around the court again, you will appreciate all the body of work you put into your comeback story. How many times a day do you check social media? Let's be real, most of you probably don't even know the number. Last week I decided to challenge myself. 3 day social media detox to see how else I spend my time. I've done a week long "social media detox" before, which was a good wake up call, but then eventually you go back to your normal ways. What about a random 3 day detox? Here were some realizations for me during my 3 day detox. 1. I found myself subconsciously checking social media without even realizing it. That was scary. 2. I was MUCH more aware of my surroundings and people around me. "Noticing" people and the activity around me...not through a computer or phone screen. 3. I engaged in more human to human conversation and interaction. Left my phone in my purse and unless someone was calling, texting me, or sending me an email, the phone served no other purpose. 5. I found myself more in the present. So it's been quite a while since I wrote (my apologies). I think I will start by recapping the final months of another wonderful summer with USA Volleyball. Although we didn't finish the way we wanted in the final week of Gran Prix, I felt like our team grew in many areas and were challenged significantly. 5 weeks on the road with the same group in foreign countries certainly poses its challenges. However, as stated in my previous blog posts, we had the opportunity to enjoy some activities and connect with the community and do things outside of our normal routine. A week and a half after returning to the US we found ourselves competing for the NORCECA Continental Championship held in Omaha, Nebraska. It was the first time the US Women have hosted an international event in four years. I would like to just point out how wonderful of a job the city of Omaha and USA Volleyball did at hosting the tournament. I thought the event was well organized, the facilities and amenities proved that we can host quality events, and it was so much fun to finally be on the side of the "Husker" fans! We finished first in that tournament and have qualified to compete in Grand Champions Cup November 12-17 in Japan. The team will all meet in Tokyo a week prior to the tournament (November 5) to train with the Japanese National Team. Before November arrives, I have to catch you up on the new adventure the month of October has brought me. For those of you who are not aware of how the International Volleyball world works...Once the National Team season ends each fall, my teammates and I compete for professional teams for 6-8 (October-May) months all across the globe...This year I've landed in Istanbul, Turkey where I will compete for the Eczacibasi Tigers. The past three years of my professional career, I've played for a club in Modena, Italy. I was comfortable with the Italian lifestyle and had developed a sense of community there. Modena became another "home" for me. I will write more on my love for Modena in a later blog post. Moving to a new place and starting a new "life" can be scary at first. The unknown is always a challenge, but I can only begin to describe what a wonderful transition it has been thus far. The Eczacibasi club is fantastic from the staff to the players. They are well organized and managed and I can understand why they are one of the top volleyball clubs in the world. I am fortunate to begin my life in the small town of Gokturk. I find myself about 20 minutes from downtown and have all the essentials here in Gokturk. I'm a "country" girl at heart, so little Gokturk suits me just fine. There is a great deal of green landscape in this neck of the woods, which makes it feel more like home in Pennsylvania. The road I travel to and from work everyday is like a windy back country road..but instead of pot holes ever 1/4 mile, there are speed bumps. Instead of worrying about deer you have to worry about goats. I wonder if goats take out trucks like deer do. My team will compete in the Turkish League and Champions League this year. Champions League is a European League where the top teams from each countries league compete to see who is the best in Europe. You can find an updated schedule on my Home Page. I will also try and update when our matches will be streamed live on the internet (check Twitter as well). I've had a few moments recently where I realize how blessed I am to play this fantastic sport for a living, and the doors it has opened to interact with such special human beings. Gary Chapman says that "Life's deepest meaning is not found in accomplishments but in relationships." My US teammates and I spend 6 days a week between the months of May and October working together towards a common goal...I've enjoyed not only competing and representing our country with them, but embracing the opportunity to build relationships by doing life with them. Playing abroad, I meet and interact with girls from all over the globe, literally. Last week there were six different languages spoken at practice. English, Turkish, Chinese, German, Italian, and Croatian. What? How cool is that. Volleyball is just the commonality that brings on opportunities, but the relationships and experiences that stem from those opportunities...those will have the most meaning in my life. Hi Christa’s devoted fans, family, and friends! I’m Christa’s cousin Alexia. It’s crazy to think that when I got back to the US after cheering at the Summer Olympics in London with my family, I saw my cousin, Christa, in a lot of newspapers and I thought to myself, how could I be related to an Olympian? The answer is that Christa worked so hard to make this possible. She started out in seventh grade playing a sport that she enjoyed, and ended up 13 years later living out her dream in the 2012 Olympics. When I found out that Christa had been chosen to help represent our country in the Olympics I thought, ‘Wow my cousin is in the Olympics’. And then I started jumping for joy. I was so proud of her in that moment I couldn’t think of anything else. Christa had fulfilled her dream and we were all so proud of her. My experience in London started out with one red tissue paper wrapped package. Actually my best friend knew about it before I did! I was in the middle of a movie when my parents brought my sister Emily and I upstairs into our kitchen and handed us each a package. I opened mine and saw a shirt. I was kind of disappointed because just the other day I found out my dad was going to London to watch Christa in the Olympics, but I remembered my manners and thanked my parents. Then my mom said to keep opening it. I did and saw a plane ticket and a piece of paper. I looked more closely at the piece of paper and saw the words ‘One ticket to London’ and ‘Alexia Mutkus’. I then pieced it together and started running around thanking my parents. I was going to London! On the flight over I was mostly thinking about how annoying it was when my sister Emily sprawled out on her chair with her arms and legs all over me. And how cool the entertainment system was. And of course how amazing it was that I was going to London to see my cousin in the Olympics! My head was being blown by all the madness of actually going to London to see the Olympics! The experience was awesome. What really strikes me as funny is how hard it was to get tickets, and yet there were a lot of empty seats! It wasn't that people didn't want to see it, but more that tickets were so hard to obtain. Even down in the nice, close up rows, there were empty seats. What I want to know is why? So many people paying to get seats way up in the top of the arena, when there were empty seats in some of the best rows! My favorite part was being there with my family. We had a lot of fun! My aunt Connie, uncle Rob, Nathan, Alyssa, Grandmother, uncle Alec, Emily, and my dad were all there and we had a great time. My aunt Connie, Alyssa, and I talked in British accents, we went sightseeing, and to nice restaurants, rode double decker buses and much, much more! I had a lot of fun in London! The funniest thing that happened to me in London had to be when we were supposed to meet Christa for lunch with the rest of the family, but went to the wrong mall, on the wrong side of London, and then when we finally thought we got to the right place, the location was changed! It was pretty funny because everyone else had lunch with Christa while we were on the other side of London. It ended okay because my grandmother and uncle Alec came to meet us and went sightseeing with us. We went to Big Ben and the Buckingham Palace. My entire experience in London was amazing and I had a lot of fun. I am super proud of Christa and without her I wouldn’t have even been in London! 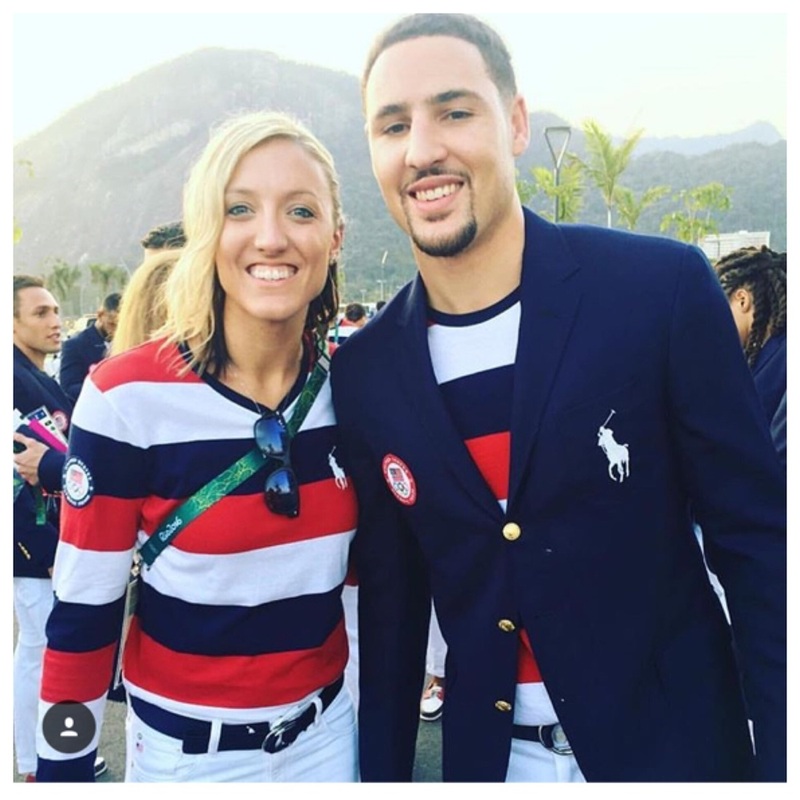 I am so proud of the USA team and, of course my cousin Christa. We had the opportunity to "get out" (doesn't happen that often on the road) and have dinner with a former USA teammate, Therese Crawford and her family at a beautiful restaurant along the water in Belgrade. There we indulged in a plate of colorful, fresh vegetables, an array of meat, and fruity baklava. Thanks again Resee! 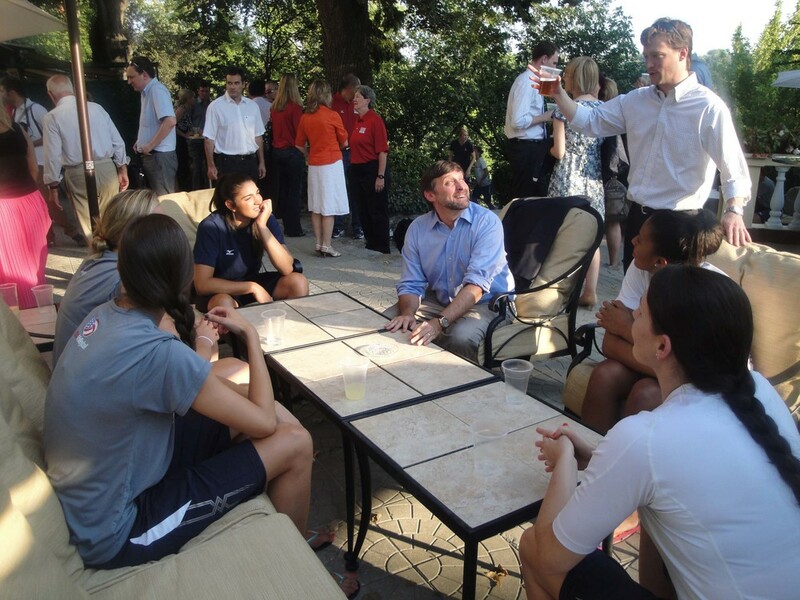 We finished practice early that afternoon and we're invited to an American BBQ at the US Embassy that evening. What a blessing it was to be "in America" for a few hours and enjoy some old fashion BBQ. My favorite part had to be picking the brains of our US ambassadors. 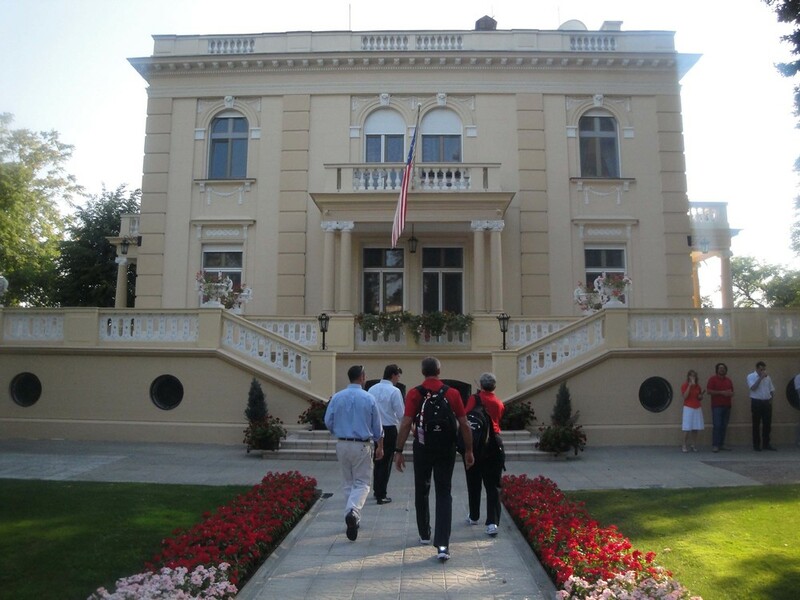 Learning about their lives and the history of the relationship between the US and Serbia. It was fun to relate to them in the sense that they too live their lives in a foreign country. For those of you who are not history buffs, the US and Serbia have not been on the best of terms until a few years ago. Several past historical events had damaged that relationship, but recently, our relationship has taken a positive turn. Serbia was a great host and we thank them for their support and "protection" throughout our stay. So quick side note, during our entire stay in Belgrade, we had police escorts and a crew of "secret service" men following us around. Thanks for your service, Serbia! "Sport is a universal language that can bring people together, no matter what their origin, background, religious beliefs or economic status" -Kofi Annan, United Nations Secretary General. A year ago, I had witnessed this universal language at the London 2012 Olympics...1 year later, I witnessed this beautiful language at an orphanage in Belgrade, Serbia. The night of the embassy trip our team was informed of an opportunity to visit an orphanage for children with developmental disorders. All 14 of us plus staff jumped on board. I remember laying in bed that night thinking about the next day, not sure what to expect...How would we communicate? Would these children be active? What are the conditions? So I prayed... God, show me your "light" in this place. And "light" there was...written all over their faces. They lit up when we all walked in, grabbing our hands, greeting us with smiles and pulling us to play with them. Within 5 minutes, we had a dance party, basketball game, and game of keep it up filled with laughing and celebration all around. What a blast, what a blessing. Moments in, I found my "girl in charge" as she was rounding up troops to play a game of "keep it up". We hit it off and jumped from keep it up- to secret hand shakes- to snapping pictures. We couldn't communicate verbally, but that "universal language" connected us. What a special day. 3 "events" in Belgrade in 7 days. Went 3-0 on the weekend. Now it's time to grab more points to secure a spot in the finals. Cheers and on to Japan! Brazil did, and always does a phenomenal job hosting. The hospitality was on point and a big thanks to all those who came out to watch, even if you were cheering for the home team ;) What a special environment to play in...fans excited, fans loud(really loud), and fans who appreciate the sport. The next stop brings us to Belgrade, Serbia. What is it? A 4, but this year, 5 week tournament featuring 20 teams from all over the world. The first 3 weeks are pool play, and the top teams will qualify for finals week (week 5) in Sapporo, Japan. If we qualify for finals, we will stay in Japan and train on week 4 and then the finals are on week 5. Return home Sept. 2! So before I give the weather report here in Campinas, I have a to say a few things. I believe it has been said by multiple people already, but we have a special group of women in the USA gym. An environment has been created this summer where taking risks and the courage to be vulnerable are becoming a large part of our team recipe. I believe those two factors are front-running our team's growth not only in skill, but trust, at a pretty solid rate. Of course it is only year one, and there is a ton of room for improvement, but let's just say it is a recipe for something special. anyways, we have had the chance to "get out" and walk around the past couple days during the afternoon to adjust to the time change (4 hours ahead of PST) and enjoy these wintery conditions. The food has been wonderful. Pretty sure I've never had a banana or mango taste this fresh. We've also enjoyed practicing in some distracting locations to prep us for the crowds we will face this weekend. Yesterday's strobe lights and today's power washer, diesel fuel, and a fresh coat of paint...headwinds. Love it.